Email marketing is as hard as you make it. With so many rules and regulations, building your campaign can seem daunting. We believe the rules of email marketing are just like the rules at recess: simple. Rewind back to grade school with this Recess Rules of Email Marketing Guide. Whether you’re the new kid in school looking to learn the ropes or the self-proclaimed king of the monkey bars, we’re here to help. We put together our top tips and tricks to help you stand out as the coolest kid on the email marketing playground. Remember the kid on the playground who loved to throw the football at unsuspecting people? Think about your emails like a football: only throw when your recipient is ready to catch. In email marketing, being polite means asking contacts if they want to receive your content, and only sending an appropriate amount of mail. To learn how to keep your mail wanted, read our SendGrid blog post: 6 Ways to Stay Relevant to Your Recipients in Your Email Marketing. As email marketers, our most important job is sending content our recipients will love, so the last thing we want to do is send spam. While there are legal definitions of spam, your subscribers might have different ideas of what should be marked as spam. The best way to avoid sending emails that could be viewed as spam is to implement the opt-in. 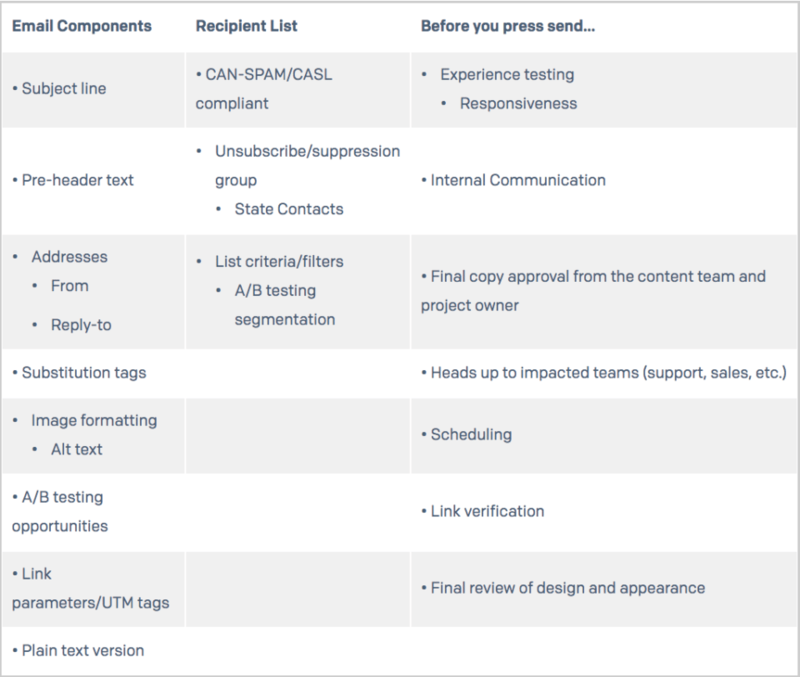 Learn how to improve your opt-in process with the SendGrid blog post: 5 Tips to Optimize your Opt-In Pages. An opt-in means your recipient filled out a form using their email address and they have given you permission to send them emails. Not only does the opt-in approach promote trust in your brand, sending to subscribers who actually want your email will improve your engagement. Once your subscriber has opted-in to receiving your email, don’t make the mistake of over sending or sending unrequested content. If they opted-in to receiving a newsletter, don’t send them promotional emails too. Chances are if they like your brand and product, they’ll eventually opt-in to receive more email from you. It’s more important to build trust and a good reputation than to send all types of email to a subscriber just because you have their address available. Even if your contact list isn’t the most extensive on the email marketing playground, manners and courtesy go a long way. It’s better to start small and build up your playground cred as a good sender than to be the kid slinging footballs everywhere. Imagine you’re having a blast at recess, and you notice a fellow classmate left a bag of candy near the tire swing. You consider taking it, maybe you even sneak one piece. Then you start thinking: Where did this candy actually come from? Is it safe to eat? As email marketers, sending to a contact list we didn’t source can be pretty tempting. It’s certainly more convenient to buy a list than to grow your own. But, just like abandoned bags of candy, using purchased lists can give way to a short-lived sugar high that will lead to a giant headache down the road. In addition to address collection, read about other deliverability tips in our blog: 5 Email Deliverability Tips from SendGrid Experts. A new email campaign can mean starting from scratch and growing a new contact list. As daunting as that may seem, cultivating an authentic list is your best bet for the longevity of your campaign. Senders run into a lot of trouble when sending to addresses that they either purchased, used in previous businesses, crawled from social media, or have acquired from a partner, affiliate, or associate. These practices can wreak havoc on your infrastructure because the people on those lists haven’t opted-in to your new email program, and they may find your email unwanted and intrusive. No matter how well you’ve set up your infrastructure or authenticated your email if you have a bad sending reputation, you won’t get inboxed well. The best thing to do is grow an email list from the ground up and never eat from a strange bag of candy. Arguably the most important lesson you learned in grade school, is to flush the toilet behind you. It’s one of the first things we’re taught as kids, and it’s a lesson that sticks with us forever. We do it so often, it eventually becomes second nature. Think about your contact list. Do you have any old or invalid email addresses hanging around? These stale contacts might seem totally harmless just lingering there, but lists containing lots of stale addresses typically lead to spam complaints, unsubscribes, and high bounce rates. • Most email service providers, SendGrid included, will automatically suppress addresses that have resulted in a hard bounce. Think of it as a safety net that’s already in place for you. • Delete any addresses that have unsubscribed. Keeping them around won’t make them want to come back. • Comb through your lists for any typos, repeats, spam traps, and dead domains to remove weird addresses that will never be engaged. Brush up on how to deal with old addresses TO keep your lists clean and eventually, regularly flushing your contact lists will be as second nature as that other type of flushing. SendGrid’s List Assist feature helps you flush your contact list and send the best email possible, read more about it on our blog. Growing up, if you got caught causing mischief, you had to apologize. As adults in the email marketing space, not much has changed, we do try to avoid saying sorry unless we get caught. Know when to address your mistake and when to let it slide. Just because you noticed a typo, doesn’t mean anyone else did. Don’t sweat the small stuff, like any spelling or grammatical errors in the copy of your email, just try to catch them in the future. So when should you send an apology? • An apology email should only be sent after you’ve exhausted all other options. • Apologize for mistakes regarding missing links or calls-to-action, and misleading offers and promotions. • You should absolutely send an apology any time data is compromised. Off the playground, we have the choice to decide if we want to apologize or not. One lesson from grade school that still rings true: the more sincere the apology, the better. Apologize when it’s necessary and mean it, and don’t forget to learn from getting caught on your mistakes. Your old teachers would be proud…unless you’re still tugging on pigtails. If you’d like even more tips, visit our blog to learn about Common Email Misconceptions from a SendGrid deliverability expert. At recess, kids are constantly running from one activity to the next. There’s usually a trail of abandoned toys and sidewalk chalk left behind. But at the end of recess, before everyone goes inside, the playground needs to be picked up and put back in order. Use our email components checklist to ensure the meat of your email is consistent throughout your campaign. Your contacts are the backbone of your whole campaign, so use our recipient checklist to remind yourself to keep your lists accurate, up-to-date, and compliant with all rules and regulations. Finally, tie up all loose ends with our before you send checklist. We believe email marketing should be simple and straightforward, just like recess. It’s important to take a breather once and a while and remember nothing is ever as complicated as it seems. Whether you’re a veteran sender or a complete newbie, always try to think back to your days on the playground.Our checklists are a great tool to help you prevent email marketing mistakes. Use them as a jumping off point for your own list, and be sure to include any company-specific points. Now that you’ve learned the basics, download our 2016 Email Deliverability Guide to learn more about getting your email delivered. If you want to learn more about common mistakes and how to avoid them, watch our Email Marketing Mistakes webcast. For more on what goes into a successful piece of email, watch our Anatomy of a Marketing Email webcast.